A Sunday afternoon 75 years ago, Maple Grove was surprised by a doozey of a storm. The headline of the Minneapolis Tribune on the morning of June 19, 1939, read Ten Known Dead as Tornado Rips Anoka and Champlin. The funnel ended up causing eleven deaths and leaving 222 people injured along its 25 mile path. It was reported in papers as far away as Mobile, Alabama where it was said to have “jumped along the countryside like a giant, destructive grasshopper.” The “jumping” traveled from the southwest quadrant of Maple Grove in a path toward the northeast before entering Champlin. An eye witness, huddled in the walkout foundation of an old barn just north of Weaver Lake, watched from the west as the twister set its path of destruction. Speaking many years later from his home in Albertville, Harold Grambart remembers being at his sister Dorothy’s birthday party at the time. She was two years old, he was seven. They rushed around debris to find an elderly Grandma Lena Grambart, sitting in her rocking chair in the only room that remained of the house. “Grandma was sitting in the kitchen just all [covered in] dirt and mud with a little scratch on her cheek, bible in her lap,” Grambart recalls the memory with long echoing amazement in his voice. The hard-of-hearing Grandma Grambart had not realized anything was amiss until she noticed things flying around the room. Laughably, the house was deemed by authorities to be “livable” and since Grandma Grambart had insurance, she was given only a quilt by the Red Cross. Rollie Rambow was 10 years old at the time but remembers the day well. His family’s farm sat on the northwest rise above Fish Lake. The Wascheck brothers and their hired man had borrowed the Rambow’s boat to go fishing. When the sky grew dark and it began to rain, they came to the house for a visit. “Their hired man watched the developing weather system and advised us to go into a small ravine. He had experienced tornadoes before, while none of us had seen one. As the tornado developed, we watched as it struck each farmstead. Debris would rise into the air,” Rambow says. Rambow’s parents, he and his older brother and four guests huddled for 20 minutes in the ravine while the tornado passed less than 400 yards to the east. 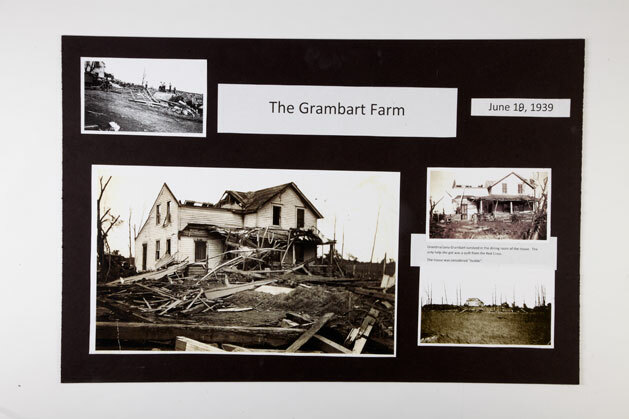 The Waschek’s watched as their house and farm buildings were leveled, followed by Rambow’s uncle Louis’s barn. The Louis Rambow farmhouse still stands on Quarles road—just another pleasant home on a quiet neighborhood street, betraying no hint of its storied past. The Gelles, along with their two-year-old daughter Carol, did live through the storm. They watched from a ditch while the Rambow windmill was blown upward and held in place by the winds before crashing down to its original location. 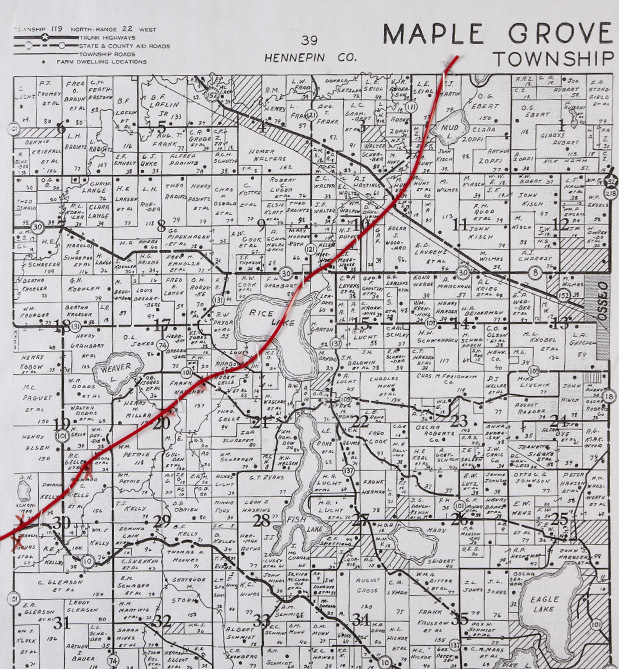 After crossing Rice Lake, the tornado continued north to level Maple Grove’s Town Hall and a number of other farms. Maple Grove families along the twisters path were lucky to survive. The property devastation was painful, but it was a time when “immediate neighbors quickly came to help clean up debris, repair and replace buildings,” remembers Rambow. Afterwards, strange and amazing stories emerged: a piece of straw imbedded in a tree trunk; cows wandering down the roads and through the woods, their fences gone; foot-high cornfields being “ripped off at ground level” as if mowed; a four-buckle lodged in the engine of a truck; looters carrying away dazed and crippled chickens as owners returned to their homes; the theft of 250 bushels of grain from a granary that was the only structure left standing at one particular farm; a cement slab impaled so deeply by a 4x4 that it took a team of horses to extract; a glass lampshade from the Waschek place discovered unharmed, rolled up in a rug and sitting ½ mile away in the Louis Rambow house. And finally, an event that seems all too familiar today, bumper to bumper traffic as sightseers came out to survey the damage. The storm’s path today would have left massive destruction at well-known locations; The Hennepin County Fairgrounds and Lord of Life Lutheran Church would surely have been demolished. 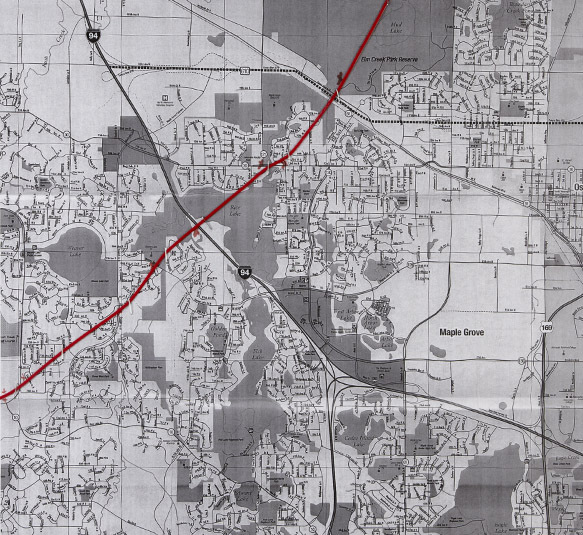 A straight line of homes from the Four Seasons housing development to just south of Weaver Lake would have been hurled into the air. The next major structure under serious threat would have been Weaver Lake Elementary school followed by parts of Boston Scientific and the rest stop on Hwy. I-94. Crossing Rice Lake, it would have headed straight for the Grove Christian Center and the Maple Grove Arboretum, winds perhaps launching the Angel of Hope into high flight. Sweeping the edge of Maple Grove Senior High and the sports dome, the twister would have crossed Hwy. 610 and traveled directly through the Elm Creek Park Reserve. The newly renovated Pierre Bottineau house, which missed the storm’s damage in 1939 in its original location, ironically has been moved into its path. The danger of this same storm in Maple Grove today would be multiplied by a population of 65,000+. Travelers on major interstate, Hwy. I-94, perhaps unaware of the danger they were motoring directly into, would accelerate the chaos. The one place you want standing after a storm, a medical center like Maple Grove Hospital, would remain slightly out of the tornado’s path. Seventy-five years later (June 18, 2014), here’s to hoping we never find out. 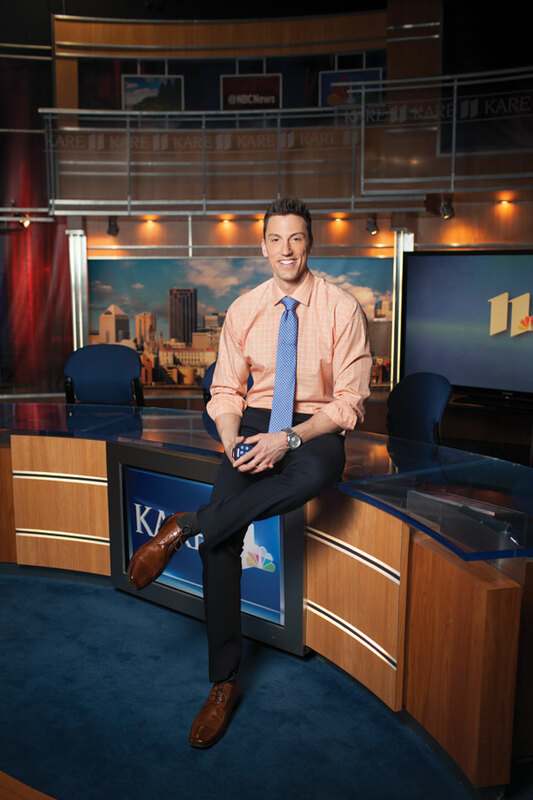 with Jerrid Sebesta, KARE 11 meteorologist. There are two myths people of Maple Grove need to know. First, living in a major metropolitan area like the Twin Cities doesn't "protect" you from tornadoes. Buildings, roads and expanses of concrete do nothing to disrupt the dynamics of a thunderstorm/tornado. Secondly, the same goes for water. Maple Grove is littered with lakes, not to mention a major river just north of town. However, there's no scientific proof that these create a "barrier of protection". In the case of a tornado, the safest place to be in your home is below ground. The problem with homes in Maple Grove is many don't have basements...they have lower-levels, which may only sit three to five feet below ground. In this case, go to a lower-level room with no windows. A utility room or a downstairs bathroom, for example, may be best. Many split-level homes have crawl spaces. This is another good option if there's time. Bottom line, stay away from windows and get as much material between you and the outside walls as possible. When in your safe location, crouch down, cover your head and your children in the event of flying debris. See additional pictures of the tornado of ’39 at the Maple Grove History Museum, maplegrovemnhistory.org. They rushed around debris to find an elderly Grandma Lena Grambart, sitting in her rocking chair in the only room that remained of the house. “Grandma was sitting in the kitchen just all [covered in] dirt and mud with a little scratch on her cheek, bible in her lap,” Grambart recalls the memory with long echoing amazement in his voice. The hard-of-hearing Grandma Grambart had not realized anything was amiss until she noticed things flying around the room. Laughably, the house was deemed by authorities to be “livable” and since Grandma Grambart had insurance, she was given only a quilt by the Red Cross. The danger of this same storm in Maple Grove today would be multiplied by a population of 65,000+. Travelers on major interstate, Hwy. I-94, perhaps unaware of the danger they were motoring directly into, would accelerate the chaos. The one place you want standing after a storm, a medical center like Maple Grove Hospital, should have remained slightly out of the tornado’s path. Seventy-five years later (June 18, 2014), here’s to hoping we never find out. First, living in a major metropolitan area like the Twin Cities doesn't "protect" you from tornadoes. Buildings, roads and expanses of concrete do nothing to disrupt the dynamics of a thunderstorm/tornado. Secondly, the same goes for water. Maple Grove is littered with lakes, not to mention a major river just north of town. However, there's no scientific proof that these create a "barrier of protection".